Veeqo allows you to connect your Magento Multi-site so you can manage your stock and orders in one place. 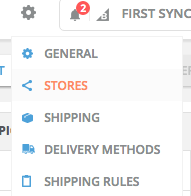 From the store settings in Veeqo you can now enable the multi-store option for your Magento. 2. Then click on your Magento store. 3. Your store's summary page will then open, then click on the Edit tab. 4. Scroll down and you will see an option for Multi-stores set-up? When the Multi-stores set-up option has been enabled it will take around 10-15 minutes roughly to pull in the sub-sites. Once the sub-sites have been pulled into Veeqo, they'll appear in a table in your store settings where it will display the Name, Currency and the store URL. You will also see a Connect button on the right hand-side where you will be able to connect your sub-site into Veeqo and once it is connected it will display as Connected. Once the sub-sites are connected, you will be able to go into the Orders page and you will have all of the channels including your multi-sites there to filter by.